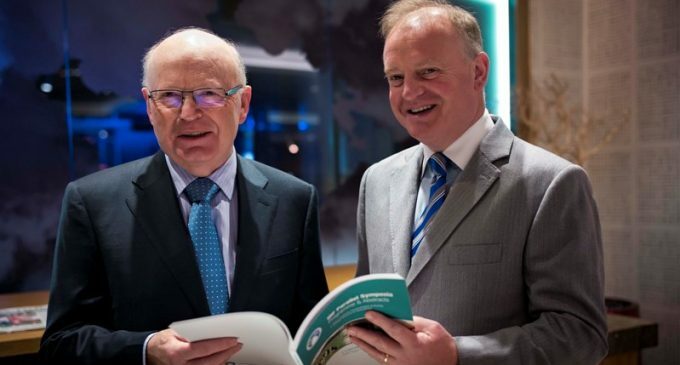 The latest developments in dairying internationally are being discussed in Dublin this week, as the International Dairy Federation (IDF) conference opened this morning Monday, 11 April. The conference is sponsored by Ornua, Ireland’s largest exporter of Irish dairy products. Speaking at the conference, Kevin Lane, Ornua CEO said: “Ornua is very pleased to sponsor the IDF Symposia and warmly welcomes the many delegates from around the world to Ireland. The ability to innovate and adapt to market needs are key to developing global opportunities for dairy and I am confident that the IDF Symposia will sow the seeds for many dairy innovations in the future’. Véronique Pilet, CNIEL in France, presented an ‘Overview of global markets for dried products and cheese, including recent restructuring and investment trends’. Novel developments from the INRA Rennes team (France) featuring two-in-one use of sweet whey to improve the biomass production and spray drying viability of probiotics, and a new process for the production of permeate powders without spray-drier. Sustainability improvements at processing level and energy saving initiatives. Special feature on Infant Milk Formula and Adult Nutritionals addressing important developments concerning regulation, analytical methodology and opportunities for novel ingredients and processes. “Next generation dried infant milk formula processing” by Dr. Mark Fenelon will showcase Teagasc Food Research Moorepark innovation in infant milk formula processing, and the adaptation of cow’s milk to bring it even closer to that of human breast milk. Latest research on the use of simulated gastric digestion of the matrix that defines cheese and the potential for even greater health benefits arising from its consumption. Advances in Cheese Flavour engineering and characterisation. Dr. Paul Cotter, Teagasc Food Research programme, Moorepark, will outline how the latest molecular diagnostic tools such as nucleic acid-based approaches are being used to investigate microbial-related cheese quality defects. This is one of the biggest Dairy Science & Technology events to take place internationally in decades, with attendees from 32 countries, having the opportunity to hear over 90 speakers, view 160 posters and interact with 17 trade exhibits. Dr Noel Cawley, Chairman, IDF National Committee, Ireland, and Chairman Teagasc, with Kevin Lane, CEO of Ornua, at the IDF Dairy Science & Technology Symposia 2016 which is taking place in Dublin from 11th to the 13thApril. The event had over 500 international delegates.